Forget Vin Diesel. Forget The Rock. Hollywood's hottest new action star is 33-year-old Australian actor Sam Worthington, who's attached to a string of major blockbusters and shows no signs of slowing down. Once a candidate to fill Pierce Brosnan's shoes in the role of James Bond (a gig that ultimately went to Daniel Craig), Worthington starred opposite Christian Bale in May's "Terminator Salvation," which didn't fare well with critics but performed fairly well in overall box-office. Worthington portrayed a cyborg in the film, the fourth installment in the popular sci-fi franchise. By far the most crucial moment in Worthington's career came when director James Cameron tapped the gruff-looking former bricklayer to play the lead in "Avatar," Cameron's astonishing sci-fi extravaganza that's become an international phenomenon. 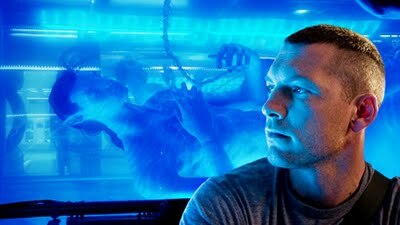 In the landmark movie, which stretches the limits of make-believe and special effects technology, Worthington plays Jake Sully, a paraplegic war veteran who signs up for a truly out-of-body experience on a distant moon. In a performance that is both flesh and blood and enhanced via motion-capture methods and computer-generated imagery, Worthington brings a good-old-boy familiarity to the John Smith-like protagonist without sacrificing sophistication. Despite allowing tinges of Aussie to slip into his American accent, he proves himself fully capable of carrying a major film. He'll get his chance again this March, playing the lead role of Perseus in director Louis Leterrier's remake of the Greek-myth saga "Clash of the Titans." Co-starring Liam Neeson as Zeus and Ralph Fiennes as Hades, the fantasy flick looks to be an impressive follow-up to "Avatar," which is easily one of the best films of 2009. Also in the works for Worthington is "The Debt," a dramatic thriller about a Nazi war criminal directed by John Madden ("Shakespeare in Love") and co-starring revered thesps Helen Mirren, Tom Wilkinson and Ciaran Hinds. What can't be far behind is an "Avatar" sequel, which has been hinted at by Cameron and is likely all but confirmed given the introductory installment's enormous success.